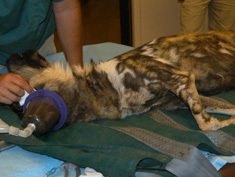 View of dog during anesthesia induction. 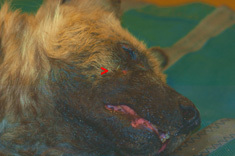 Red Pointer indicates location of recurrent fistulating abscess below right eye. Intra-oral view of maxillary right 1st molar. 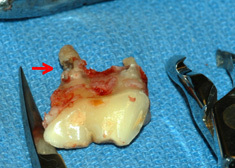 Notice this tooth presents a near perfect clinical crown without any sign of caries or fracture. 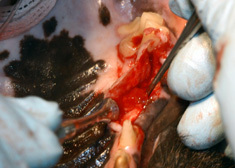 View of pre-packaged dental film in position within the oral cavity ready for exposure by x-ray. 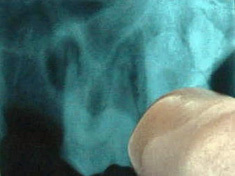 X-ray image of molar tooth reveals significant apical abscessation involving both mesial and distal tooth roots. 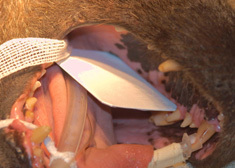 Creating a “surgical moat” around tooth underneath a retracted full thickness muco-gingival soft tissue flap in order to facilitate removal of the tooth with minimal bony trauma using a high speed dental hand-piece with a cross cut fissure bur. 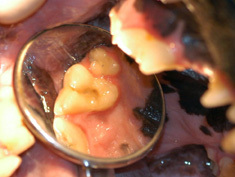 View of freshly extracted molar tooth. Notice root caries at red arrow, confirming the fact that the apical abscess involving this tooth would NOT be resolvable with endodontic therapy alone. 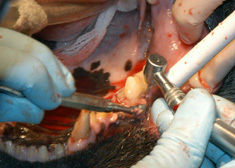 View of extraction site while removing mass of infected soft tissue surrounding mesial root. Note: All of this infected tissue MUST be removed to fresh, clean bone in order to insure proper healing of the extraction site. 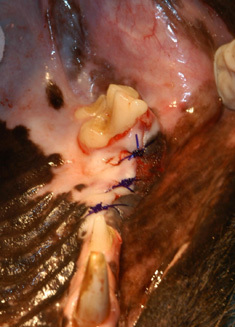 View of extraction site sutured closed to protect Bioglass, particulate bone graft materal within.